Hornby is not only a household name in the UK , but is well known and used by model railroaders worldwide. Apart from the extensive and ever expanding range of locomotives, rolling stock, buildings, accessories and track, Hornby also provides a reasonable DCC system. 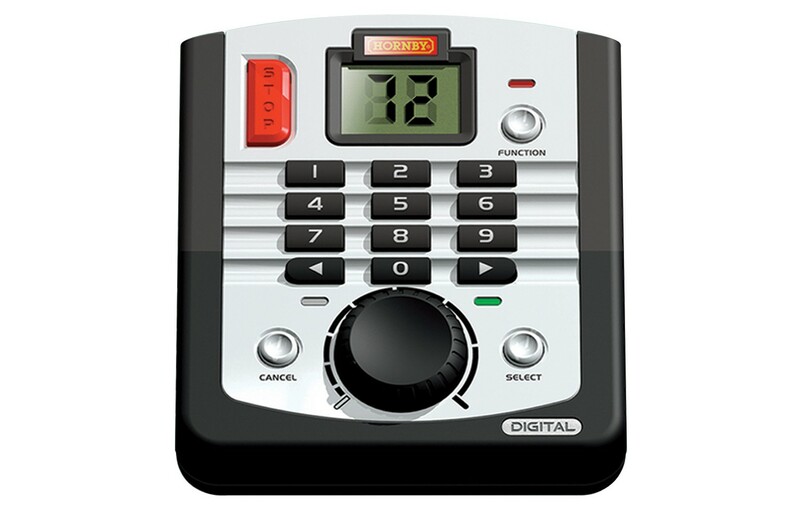 The Hornby Elite Digital Controller offers “Twin” control with press switch functions, 17 button keyboard, wide function LCD screen display and a 4 amp transformer plus the capabilities of registering 254 locomotive addresses as well as 255 accessory addresses, and that includes point control. 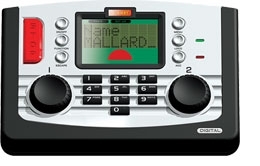 The unit also provides a USB portal for linking to a computer and the internet. 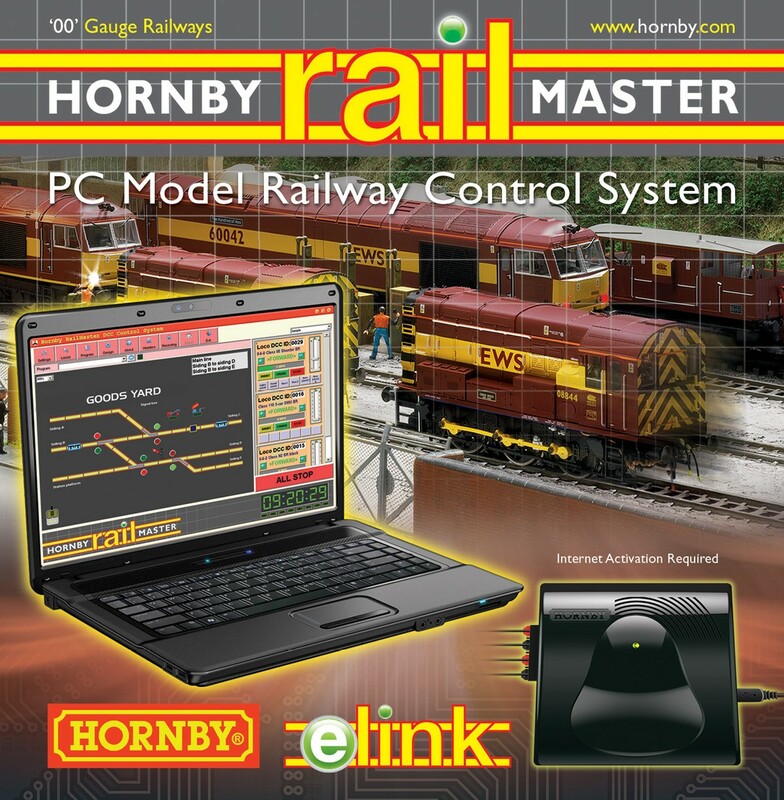 TrackMaster is Hornby’s model railway planning & Control software and is aimed at designing a layout (to ensure the geometry works instead of resorting to trial and error during physical assembly), and then controlling that layout from a Pc. Founded by Frank Hornby establishment the company Meccano Ltd in 1907. Meccano production continued during the First World War and Hornby took the opportunity to introduce toy trains in 1920. Hornby Trains were powered by a high quality clockwork motor, made of metal pressings held together by Meccano nuts and bolts, and ‘0’ gauge in size. Hornby Trains were an instant success and the company was quick to introduce more engines and accessories. In 1925 the first Hornby electric train was produced, operating from a mains supply of 100-250 volts. By 1929, Hornby had evolved a much safer system and electric models worked from a six volt DC source. In 1938, Hornby Dublo (‘00’) was launched. This was approximately half the size of the ‘0’ gauge system. The new locomotives had cast metal bodies rather than pressed metal, and the buildings were made of wood. Both clockwork and electric sets were available before the Second World War, although these were limited to Sir Nigel Gresley, an LNER A4 Class Pacific, and an LNER Class N2 tank locomotive in the liveries of the ‘big four’ companies of the time (GWR, LMS, LNER and SR). Production stopped during the Second World War (1939 – 1945) but Hornby Dublo soon reappeared once the war was over, although without a clockwork range. By the late 1950s, it was clear that Hornby Dublo was losing ground to its competitors and changed from a three-rail system to the established two-rail track system in 1959. Hornby came under increasing pressure from rival company Tri-ang Railways, who had developed plastic bodied trains and carried out its manufacturing at a purpose-built factory in Margate, Kent. 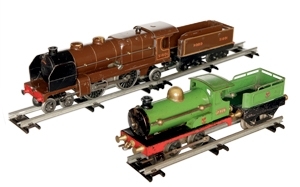 Hornby Dublo and Tri-ang Railways rivalled each other during the early 1950s and following the acquisition in 1964 of Meccano Ltd was taken over by Lines Bros (the parent company of Rovex Scale Models Ltd, manufactures of Tri-ang Railways), in 1965 and became Tri-ang Hornby. Production of Hornby Dublo ceased in 1964 and some of the tooling was purchased by G&R Wrenn Ltd (another subsidiary of Lines Bros.) to launch Tri-ang Wrenn in 1967. The Tri-ang Hornby period is best remembered by many for the change to British Rail blue liveries on diesel locomotives, the introduction of pre-Nationalisation liveries for steam locomotives and the launch of Battle Space and Battle Zone. Some of the locomotives produced during this time included the E3000, Hymek, Class 37, M7, Hall Class, Coronation Class, Flying Scotsman and Evening Star. 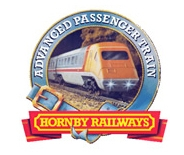 The Tri-ang Group was disbanded and sold in 1971 and the model railway system which had in 1972 been known as Tri-ang Hornby was renamed Hornby Railways in January. Even though the name changed, production continued at the Margate factory. The specification of a large part of the range was also upgraded to make it more attractive to adult enthusiasts and improvements were carried out to provide finer scale wheels, wire handrails on locomotives, better paint finish on plastic bodies and high definition printing of logos. In 1980 the company, now known as Hornby Hobbies Ltd, became an independent company and on 29 October 1986 was floated on the Unlisted Securities Market, becoming a public company. Changes taking place on British Railways and privatisation of the railways at this time brought several new eye catching liveries that were eagerly modelled by Hornby. The demand for these liveries and higher standards of modelling led to a number of models being retooled. New products also included a Thomas the Tank Engine and Friends range, based on the television series. The Thomas series was launched in 1985 at the same time as other new models were added to the Hornby range, including BR’s electric Class 90 and 91 locomotives and Mk4 InterCity coaches. Today, more privatised companies using the railway system have brought a further choice of new and diverse liveries to model. All Hornby manufacturing was moved to China in 1995 and the first totally new ‘Far East’ model was a Rebuilt Merchant Navy Class locomotive, which was to become a benchmark of quality for future locomotives and rolling stock. Hornby launched the first commercially produced ‘00’ gauge live steam locomotive in September 2003, paving the way for another product line to the Company’s already expanding range, consisting of more than 650 current items. Now simply called “Hornby”, the company justifiably retains the position it has held for more than 50 years as Britain’s leading model railway manufacturer.